Our new story for this week, Polar Bear, Polar Bear, What Do You Hear?, didn't have the same intrigue as last week's story (The Incredible Book Eating Boy),which they're still talking about this week. The simple, repeating text was great for encouraging "reading" along and interaction though. We played a listening game where I played real recordings of animal sounds on a CD and they had to match the sound to the correct animal from our story. It was interesting (even for me) to hear these animal sounds. Ever heard the sound a zebra makes? Very unusual. It sounds like a dog barking! That one really stumped the kids. I'm having fun hearing the kids recap our story from last week every time we meet. One little girl came in today and saw last week's book and said, "Look! It's the incredible boy!" I was so excited that she remembered, and used, the word "incredible." This first month of class has been an opportunity for us all to get into the swing of class, introduce the kids to some basic concepts, and get them pumped about "reading" class. I think I've been pretty successful with all those things. They all seem to be having a lot of fun, which is the most important thing. I love coming to get them for class and hearing them say, "I love 'reading' class!" 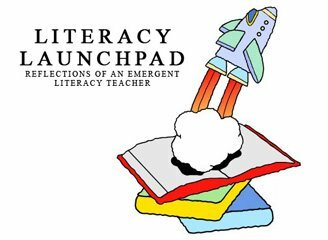 There are a few that actually refer to class by it's official title - Literacy Launchpad. It's even cuter when they say that! Reid is now at Cheekwood! He's all settled in, and hopefully enjoying himself. I saw some GREAT scarecrows out there, and I didn't even get a chance to look at very many of them. One of the scarecrows near Reid even has a bike! It's all so much fun; I can't wait for our field trip! Labels: animals, Bill Martin Jr., lesson, Polar Bear Polar Bear What Do You Hear? So The Incredible Book Eating Boy has a firm hold on the hearts of my kids. They are ALL still talking about it this week. They loved it! And it seems that many of them memorized the text last week; they can practically read the story to me! I love that they have fallen in love with this new favorite of mine. Reid will be heading out to Cheekwood tomorrow to be officially installed. "Installed" seems like such a harsh word to use when referring to my new buddy that I've been spending so much time with over the past couple weeks. He'll be happy there though. The kids have been asking about Reid this week. They want to know where he is. And they seem excited about the idea of going to visit him at Cheekwood. I'm hoping to see many of them out there with their parents! I'm finally moved into my new house. Yay! Hopefully things will quickly be returning to normal. I do still have a garage of boxes waiting to be unpacked, but at least I live in the same place as my internet access. That's a step in the right direction! This past week we read The Incredible Book Eating Boy by Oliver Jeffers. The week started off a little bumpy. This is a more sophisticated story (in the Literacy Launchpad repertoire), and I started the week by trying to completely re-read Caps For Sale from last week AND read our new story. It was hard to keep the kids attention through both those stories back to back, and it was difficult to try to squeeze everything from my lesson plan into our class time. So I revised my plan, and the rest of the week we just reviewed Caps For Sale. We don't usually do this; we almost always re-read our story from the previous week. It worked out well though; I enjoyed hearing the kids give me a summary (instead) of what happened in the story. They surprised me with how much they remembered. One of my younger students even remembered that at the end of the book, the peddler "walked back to town." The Incredible Book Eating Boy is a story about a boy that eats books (it started "quite by accident"). But all the information from the books ends up getting mixed up in his brain, and he gets sick. So he ultimately opts to read books instead of eating them, and he hoped to someday become the "smartest person on earth." I loved this book. It was clever and funny, and had just the right amount of text. It flowed really well for a read-aloud, and the kids responded really well to it. The kids are really getting into the predicting, and this book provided many opportunities for both predicting and brainstorming. They predicted what would happen when Henry ate books, they guessed what books might taste like, they discussed whether they would ever eat a book (no worries, none of them sounded interested), they predicted what he would do with the books after he stopped eating them, and they brainstormed other silly things he could eat. When I asked the kids what they thought books tasted like, most of the kids responded by making faces and telling me how gross they thought it would be. But there was a girl in one class who told me very seriously that books tasted "probably like watermelons." We did a couple activities with this lesson. We played a game where they fed books into Henry's mouth and Henry ended up "getting sick." Then we talked about how Henry should read books instead of eating them. 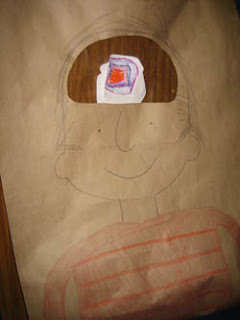 So the kids then made their own books for Henry to read and put in his brain. You can't see it very well in the photo below, but there is a cellophane pocket inside that cut-out in Henry's head. So the kids decorated their book covers and then dropped them into Henry's brain. They liked seeing their book in his head! We talked about how Henry was getting smarter, and smarter, and smarter! I also had a buddy come to class with me all last week - Reid! He wanted to come hear some stories. He asked if he could join our class, but we decided that scarecrows don't belong at school, and that he would be much happier at the Cheekwood Botanical Gardens. We told him we would come visit him there though, and read him a story when we did. So I invited all my kids to come join me out there next month. They were so funny, many of them told me (very concerned) that there parents didn't know how to get to Cheekwood. I assured them that we would work it out! The kids were all excited to meet Reid. Well, almost all the kids. There was one group of younger children that were very nervous about Reid being in class with us, and I had to move him out into the hall. I guess they don't call them scarecrows for nothing! And some of you have been wondering what Reid looks like. Well here he is! Thank you to Jen Barney for suggesting this idea for Reid's style. He's still not compeltely finished. He forgot to bring his backpack to class with him last week, but he's planning to bring it to Cheekwood with him. Keep hanging in here with me. I have internet at my new house, but I still don't live at my new house yet. So my internet access is still limited. I move Saturday though, so I'll things will be back to normal soon... theoretically! 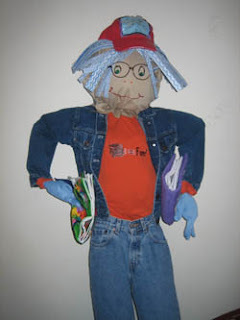 As many of you know, Literacy Launchpad will be submitting a scarecrow for display at Cheekwood Botanical Garden's Scarecrow! exhibit this autumn. Well... the scarecrow is ready, and his/her/its name is "Reid Toomey"! He turned out cuter than I imagined he would, and he is traveling with me to classes this week! He's cumbersome to travel with, but so worth it! The kids are enjoying having the visitor, and I can't wait to be there when they see him in the gardens at Cheekwood! Please forgive my scatteredness (that's not a word, is it?) this week. It will most likely continue into next week. We (my husband and I) closed on our new house this week, and will be moving next week, so everything in my life is in transit pretty much... including my internet (I'm blogging from a school right now)! The internet at my old place is gone, and it is not yet working at the new place. :-( So thank you for your patience with me. This was a fantastic first week of Literacy Launchpad classes! The first week is always a little rough for me, because my kids have moved up into new classrooms, and I have newly enrolled children, and I spend a lot time trying to hunt down my class of kids. But I found them all! The kids all responded to Caps For Sale (our story this week) with such enthusiasm. Our read-alouds were nice and long because we were discussing and predicting as we were reading. And none of it was forced! Most of the dialog was initiated by the children. I love how observant they are. We talked about how the peddler got the tall stack of caps on his head. We talked about what a "peddler" is. We talked about what "wares" are. We debated what color the peddler's caps actually were (they didn't look like the colors that the author identified them as). We wondered what happened to the peddler's caps when they were gone after his nap. We wondered why the monkeys took the peddler's caps. We laughed at the silly way the monkeys acted. We wondered if the monkeys were going to give the peddler back his cap. We discussed what we might say to the monkeys if we were the peddler. We made angry faces like the peddler. We wondered if the peddler was ever going to sell any of his caps. We wondered why the monkeys didn't buy the caps from the peddler. - One little boy concluded that the peddler "must be nocturnal" because he was sleeping during the day. How many four-year-olds use the word "nocturnal"?! - Another little boy told me that the monkeys could not have bought the caps from the peddler because monkeys don't have money. I was pretty impressed that he could reason that out on his own. ...And then he told me that the monkeys would have money when they grew up. So there was something in the story that made this little boy decide that the monkeys were not adult monkeys. I wonder what that was? I wish I would have dug a little deeper with him on that one. I had never given much thought to the age of the monkeys in the book. I'll end my post here for now. I've gotta run. But I will hopefully be posting again this weekend! Today was the first official day of Literacy Launchpad for the year! Hooray! And this week we're reading Caps For Sale by Esphyr Slobodkina. This is one of my favorite stories of all time. I remember the librarian at my elementary school reading it to my class when I was young, and I find myself mimicking the gestures and inflections she used when I read the story. I met with two great groups of kids today(2 yr. olds through 4 yr. olds). They all did so great. It amazed me how well they all jumped into the swing of things on our first day of class! Especially since many of them are new students that weren't with me last year. There were a few kids that came in with the wiggles, but isn't it amazing how a good book can calm even the most outrageous cases of the wiggles? The kids laughed at the monkeys in the book, shook their fingers and stomped their feet like the peddler, showed me their angry faces, made monkey noises, and began making unprompted predictions! I was so proud of them! 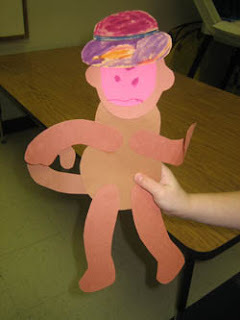 After our story and discussion, we made monkeys out of construction paper. And decorated our own caps to put on their heads. 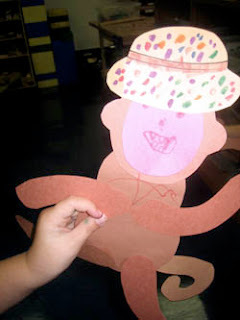 The kids were excited about telling me what kind of monkey they made: mean, sad, nice, etc. I love their creativity. One little girl even gave her monkey sharp, scary teeth! Yikes! Don't mess with that monkey! It was so fun to be back at school, and to hear the kids saying, "Hi, Ms. Amy" in the hallway. It's going to be a great year! More news to come later in the week! I haven't seen WordWorld myself yet, but I'm very intrigued by what I have heard about it. From what I can gather, they spell words out on screen, and then once the word has been read, it becomes the object that it represents. For example, after they have spelled and read the word "truck," the letters morph into a picture of a truck. I read a press release about the show, and there is more to the show than morphing words (or so they claim), but again, I have not seen it myself yet. I plan to set up the DVR so I can check out what all the fuss is about. I doubt it will ever take the place of Between The Lions in my heart, but maybe it will come in a close second. Let me know if you've seen the show, and what you think of it. Especially if you have children that have watched it! I returned from my girls' weekend on Tuesday, but have been playing a crazy game of catch-up all week. I feel a lot like a dog chasing my tail. Literacy Launchpad classes start next week, and I'm preparing lessons, organizing enrollment, and delivering brochures. Busy, busy, busy, but it's all fun stuff. My weekend was great though. I had such a good time with family and friends, especially my nieces. Check out these fun photos of my three-year-old, book-loving niece. 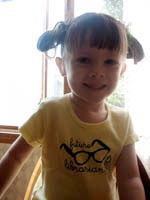 Her shirt says "future librarian"
She's asleep under the book!